The official VMworld Barcelona session catalogue was huge and full of VMware sanctioned content. However running in parallel there was a fantastic community run fringe event. The #vBrownBag guys stepped up to the plate and spent a lot of personal time to put together a whole series of short Tech Talks where anyone with something to say could have the spotlight. Now, this wasn’t some soap box in the corner of a room with some nutters yelling into a megaphone but a super organised, livestreamed sponsored event with some serious content. There were VMware employees and engineers talking about how you can run some seriously awesome yet unsupported VMware configurations as well as some seriously brainy and very highly regarded community members who have a passion for virtualisation and in their own time put together presentations that they thought the VMware community would be interested in. Luckily these were all recorded so you can take some time out and see for yourself what the VMware community has to contribute. 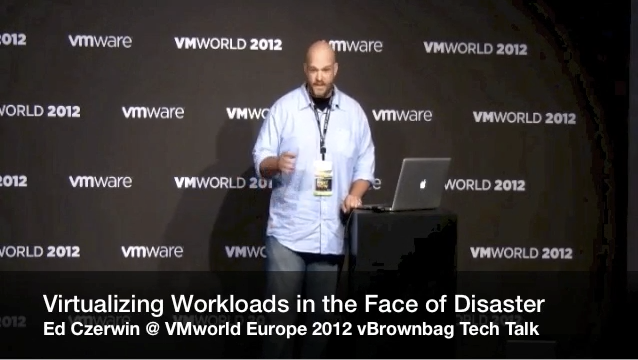 Thanks for putting this together and giving out some vBrownBag love!